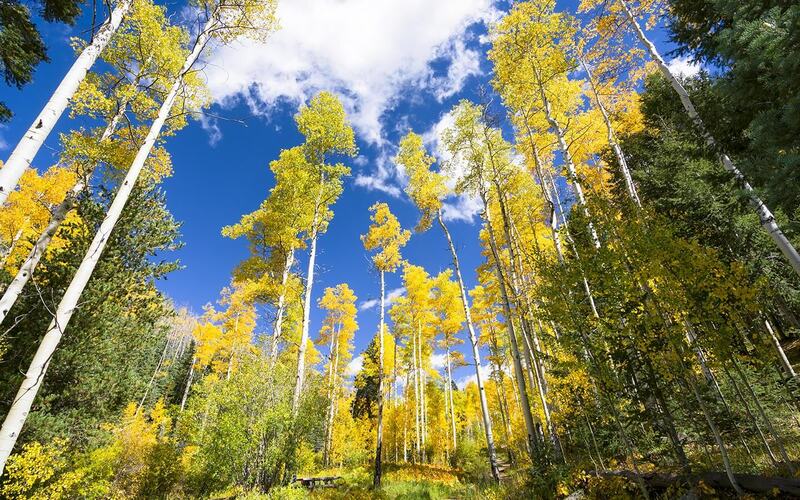 Some of the city’s best restaurants are a short drive away from our Santa Fe bed and breakfast. 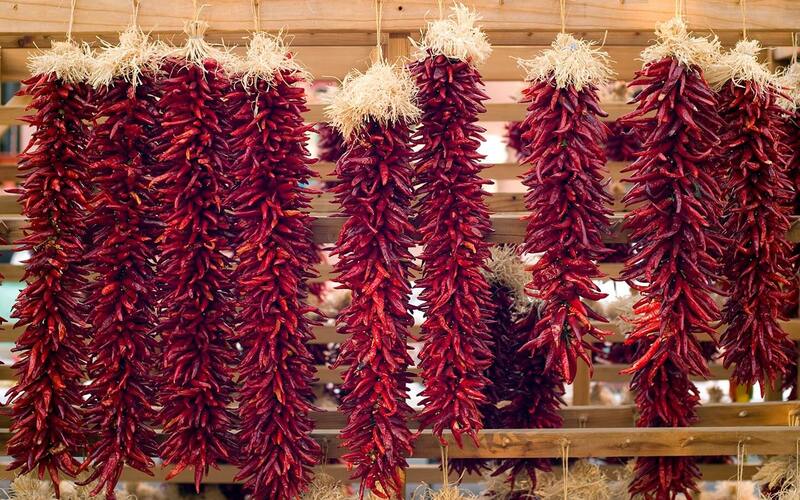 If you want to eat like a local, don’t miss these top restaurants in Santa Fe, New Mexico! We love Jambo Café! 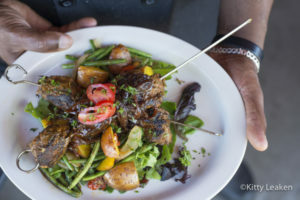 This innovative restaurant specializes in African-Caribbean fusion cuisine. Jambo is the winner of numerous awards including Best Soup at the Santa Fe Souper Bowl for four years in a row, and the Santa Fe Reporter’s Best International Cuisine for six years running! Jambo Café has also been featured on the Food Network’s Diners, Drive-ins and Dives. We love the lively, colorful and warm interior setting. David loves their Moroccan lamb stew or jerk chicken and I can’t resist their tasty house salad and amazing vegetarian sandwich. Their house-made Chai tea is great too, hot or cold. You’ll find Jambo Café at College Plaza Shopping Center, 2010 Cerrillos Rd. Photo courtesy of Kitty Leaken. 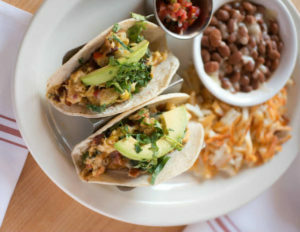 One of the hottest new restaurants in Santa Fe and one of our favorites is Paper Dosa! Starting as a pop-up restaurant, Chef Paulraj Karuppasamy and his wife and partner Nellie Tischler, had been serving delicious south Indian food using family recipes. The menu’s stars are dosas, uttapams, and curries. If you aren’t familiar, dosas are thin, crispy crepes and a staple in southern India. 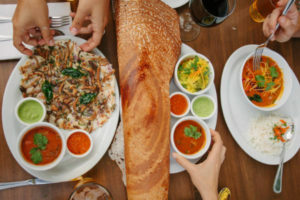 There are various recipes and techniques for making dosas; the ones at Paper Dosa start with a batter that contains fermented rice, lentils, and ghee. We can’t resist their Chile Onion Pakora for starters, and usually follow it up with a curry and a dosa of course. Don’t forget to try their homemade lemon pickles and one of several imported Indian beers. Paper Dosa is across from Trader Joe’s at 551 West Cordova Road. The Plaza Café Southside is the offspring of the legendary Plaza Café, a Santa Fe institution since 1947 and owned by the Razatos family. 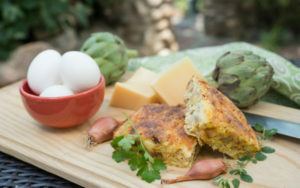 Southside owners Leonard Razatos and Belinda Marshall have a simple mission: tasty food to make you feel right at home. And they succeed every time! The fun diner-like interior features colorful murals and a great collection of Zozobra art. Their menu offers an innovative and delicious twist on diner food standards, authentic New Mexican cuisine, and decadent desserts. 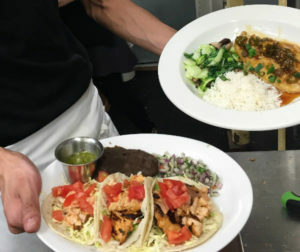 We are in love with their fried calamari with jalapeños starter and their crispy avocado or Baja style fish tacos. Their turkey melt with onion marmalade & avocado is Dan & Alex’s favorite sandwich in Santa Fe! Definitely worth the 20 minute drive from the Plaza, you’ll find Plaza Café Southside at 3466 Zafarano Drive. Harry’s Roadhouse is many things to many locals. As the name would suggest, it’s a roadhouse, but it’s also a diner, a bar, and in summer, a garden café, where you can eat lunch or dinner amid hollyhocks! On almost any night, go early or be prepared to wait among the hungry locals. 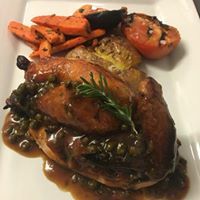 Their extensive menu features typical American comfort food like burgers, pizza, pasta, and salads, as well as innovative dinner entrée specials. Save room for dessert as you’ll find an array of classic, tasty offerings like pies, cakes, cobblers, and crumbles. This funky, colorful, rambling restaurant is southeast of town at 96 Old Las Vegas Highway about 20 minute drive from the Inn. Executive Chef Cristian Pontiggia uses best-of-season vegetables, wood-fired meats, and homemade pastas as the basis of El Nido’s menu. It features four sections: In the Beginning for starters, Todays Harvest for soups & salads, Flour + Water for their pizza and pasta, and Embers + Ashes for their rotisserie and grilled offerings. We’ve always chosen to dine in the cozy barroom, with booths along the wall, sporting colorful Santa Fe-style hand-painted window surrounds that have been there for decades. On a cold winter’s evening, a wood fire merrily burns in the fireplace at the back of the main dining room. When we think El Nido, we think: elegant, rustic, refined, delicious food in a fine-dining atmosphere without pretense. 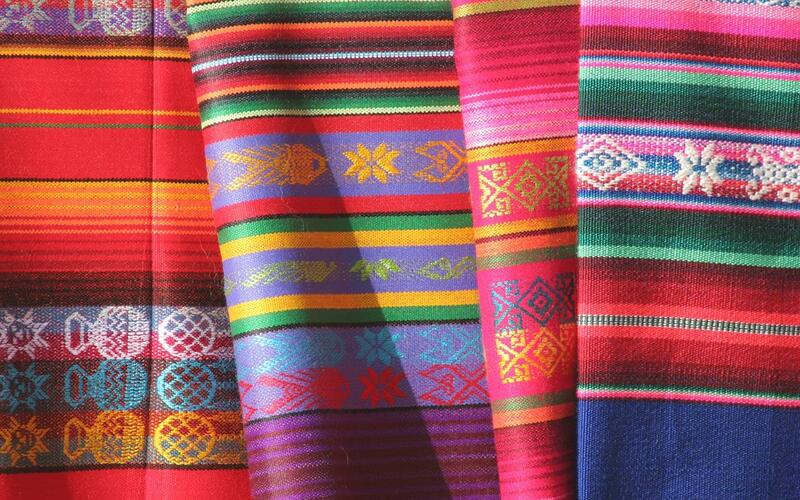 El Nido is in Tesuque, about a 10 minute drive from the Plaza at 1577 Bishops Lodge Road. We first dined at The Pantry during our very first visit to Santa Fe back in 2006 and we’ve been dining there regularly since. 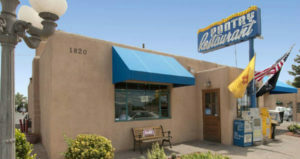 A bustling local favorite, The Pantry has been serving up traditional New Mexican favorites since 1948. The same menu is served for lunch and dinner and you can get breakfast all day. Their Pantry Fries, large diced fried potatoes with a touch of red chile, are not to be missed! We love their huge breakfast burrito with carne adovada, which is slow-roasted marinated pork cooked in red chile – perfect for when you need a chile fix! They also serve American comfort foods such as meatloaf, chicken-fried steak, grilled pork chop, and a variety of sandwiches. For dessert, try the tres leches cake. If you visit during prime lunch or dinner dining times, expect a wait… but it’s totally worth it to eat like a local. The Pantry is located at 1820 Cerrillos Road. Of course, when you stay with us, you’ll also be starting your every day on a delicious note. Our guests enjoy a complimentary gourmet breakfast every morning, introducing them to an array of local ingredients and southwestern style. So book your favorite room today and get ready to dig in to the flavors of Santa Fe!